We arrived in Ecuador on July 4th. Since then, we have not had more than a week in one place. During this time of extreme travel, we have had many adventures. Whale Watching: In Puerto Lopez, we took a 40 foot cruiser out into the ocean. The waves were large, and the boat rocked a lot. After an hour of riding, the boat pulled to a sudden stop. Everyone in the boat started pointing to something. I turned around and saw a 16 meter humpback whale swimming nearby. I took a deep breath in wonder and then heard the captain say that a few of us could get on the top of the boat. My Dad and I were two of four that volunteered quickly enough. When I reached the top, I realized that it was just the roof of the boat. There was no handrail, nothing to grab onto if you started sliding. I sat down and tried to get a view of the whales. At first, I saw them splashing their tails and frolicking in the water. I was already amazed, so imagine my incredulity when one (of the two) whales suddenly jumped out of the water. It almost cleared the water, making a huge splash that left me trying to get a grasp on the roof. After a few rocks of the boat, it leveled out again. Then the other humpback whale did the same thing. I thought, “This is way better than a movie or Pacific Life commercial.” Both whales continued jumping (sometimes synchronized) and awing me for twenty more minutes. This was like God saying, “Look what I have made.” The humpback whales were two females, trying to attract mates. 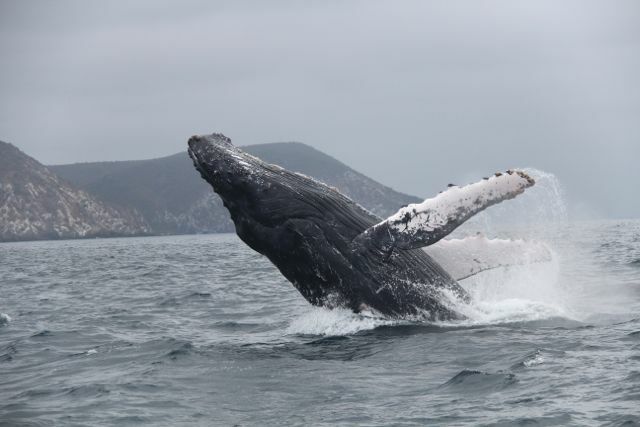 Every year, humpback whales migrate from Antarctica to Ecuador, a journey thousands of miles long. In the warmer waters of Ecuador, they are able to reproduce and raise their young until the newborns are large enough and have sufficient blubber to keep them warm in the freezing waters of the Antarctic. I was astounded by this experience. Puenting: My brother, friend, and I all did something incredibly crazy: We jumped off a huge bridge. Puenting. That’s what they call it. A crazy fad, similar to bungee jumping. We were on a 120 meter tall bridge. After putting our harnesses on, we took our turns standing on a small platform, looking down to the rushing river. Then, “Uno, Dos, Tres.” That was the signal to jump. Jump. Off this bridge. The three of us did it. It was raining that day, and very windy. We all enjoyed the adventure, crossing off another thing on our list… There is a video that I made of this experience below. 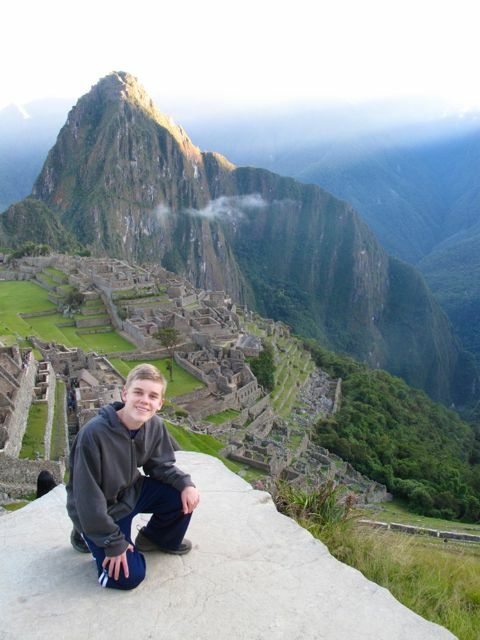 Other experiences (some were in Peru): Boogie Boarding on the coast of Ecuador, Reaching summit of 18,000 foot mountain, Visiting Machu Picchu, Riding Bikes with the Mims, Spanish Language Lessons, Long Rides in Buses (over 10 hours in a day), and more. We have all enjoyed our wonderful 5 months of being vagabonds but we are excited to finally settle down. For the next four months we will live in a city in Ecuador. We are hoping to live in Baños, and will live there unless my brother and I are unable to attend the public school there. This will be a transition in lifestyle, and we will need to adjust. Through our adventures in Ecuador, we have seen much culture, from traditional farmers at the animal market, to well-dressed people ready for another day of business. This has widened my horizons and given me appreciation for what I have and this opportunity. I am thrilled at what we have seen so far and excited for another experience. Love the video. You really captured the experience. Just glad you did not get my audio when you all jumped! Amazing experiences that are beautifully expressed, Adam. The video is a little too scary for grandmoms, however. We were awestruck by the 18,000 foot climb in Peru. This is really over the top. Hope you enjoy school and the Ecuadorean soccer. You guys are just having too much fun! I wish I could have been there watching the whales or junping in to swim with them. I would have loved the Puenting. I did not see Bob or Carrie in the video. I am sure they went just after you though, when they were done shooting the movie. I am envious of your backpacker life, sitting here at my desk struggling with quarter end deals. Enjoy your freedom and adventure for as long as you can! Patrick, all has been good, (except for me, watching the boys jump off a bridge was a bit much – and I wasn’t even there. I saw it only on video). Our adventures will slow down now as the boys start school tomorrow – a different type of adventure. We are still savoring great memories of Machu Picchu and Ausangate with you and Andreas. Thanks again for coming to Peru. That was an awesome time! Great videos and descriptions. Don’t know what you will ever do for an encore to this one. I would really like to have been with you on all the adventures except the “puenting”. I hear that most of the ropes in South America are rotten. Guess you were lucky. Anyway we are heading to the wedding tomorrow, so I have to run. Great description of the whale watching, Adam. It just sounds and looks incredible! You did a great job on your video! All the Parkers freaked out as you guys jumped off the bridge. Toooo crazy!! Es muy bonita su página y es muy interesante lo que han escrito acerca de mi querido Ecuador….bendiciones.